Need Dance Floors & Staging for your next party or event? We've got the Dance Floors & Staging rentals you've been looking for. Browse our selection below. No matter what type of event you’re hosting, nothing tends to draw the attention of guests quite like a stage, a dance floor, and some good music. 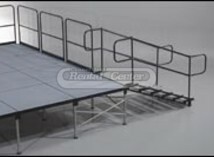 Whether you’re expecting a crowd of 50 or 500, CT Rental Center offers a variety of stages and dance floors to meet your needs. 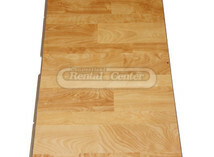 We carry both indoor and outdoor dance floors in customizable sizing options. 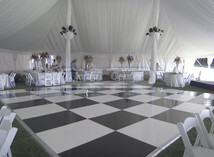 The warm color of our New England Plank wood floors are a beautiful addition to any event and our black and white floors provide a checkerboard pattern that adds a unique and contemporary look. 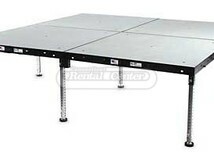 If you're in need of staging rentals in CT, we offer stages available both with or without steps. If you have any questions about what size or style staging or flooring is best suited for your party, don't hesitate to call us at (860)-347-4688. We have experienced event coordinators and rental specialists that are here to help you make your next big event the best it can be! To make it even easier, you also have the option to create a wish list or request more information right through our website!